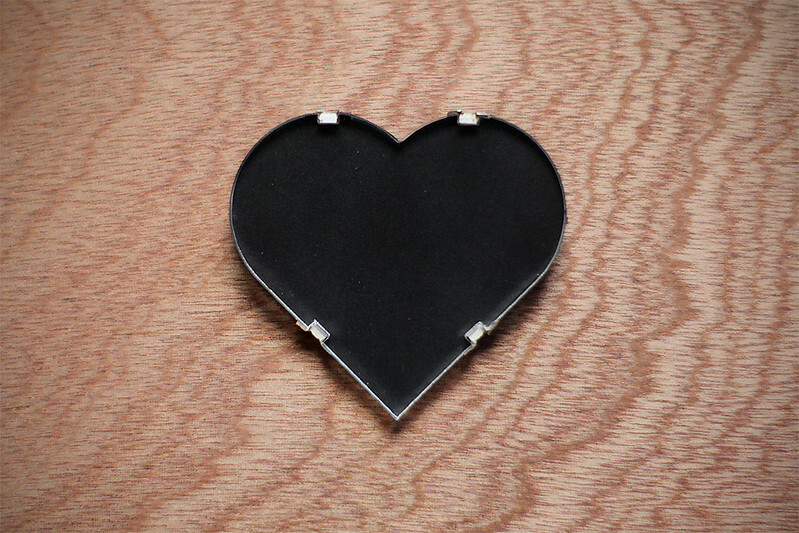 Heart On Your Sleeve is a wearable device that attaches to a user’s sleeve and displays their current heart rate. 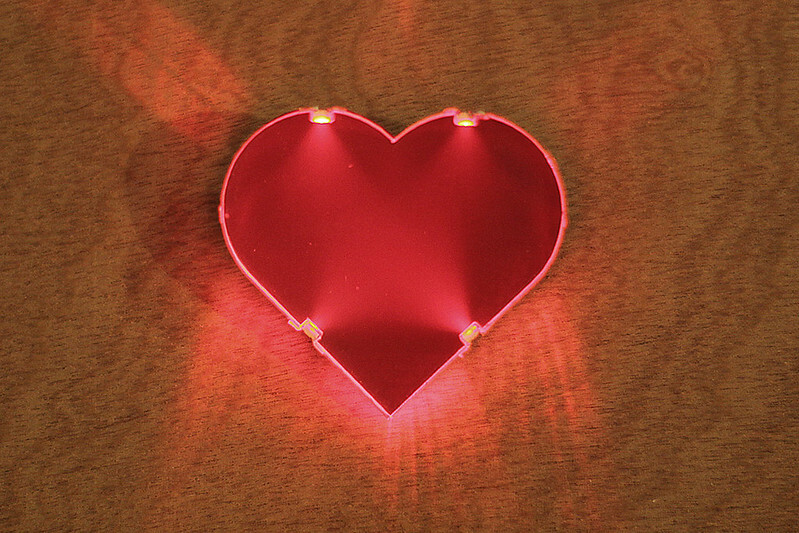 The heart itself is a sheet of Endlighten, which is a transparent material embedded with colorless, light-diffusing particles. When a light source is applied to its side, the whole panel appears to illuminate. I cut the material to size using a laser cutter, including small divots for surface mount LEDs to provide the light. Traces for the circuitry were laid by hand using copper tape with conductive adhesive, which is becoming one of my favorite materials to work with. At the center of the circuitry is an ATTiny85, which I programmed using an Arduino after reading a tutorial from the High-Low Tech group at MIT. Input is read from a small reflective photo sensor on the wearer’s finger and processed by the chip using code adapted from Charles Martin. When a heart beat is detected, the chip triggers the SMD LEDs (with similarly sized 100 OHM resistors) surrounding the Endlighten. 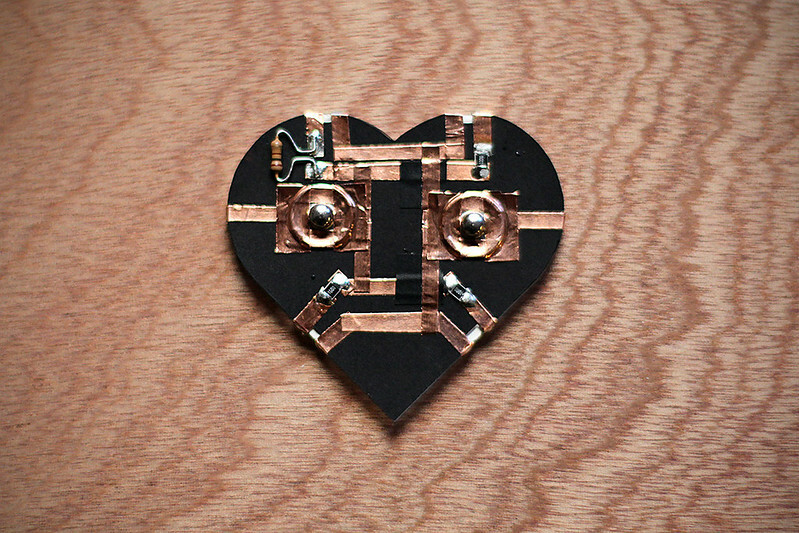 The whole circuit is powered by a tiny, 3.7v Polymer Lithium Ion Battery from Sparkfun. This project was completed as my final in Catarina Mota‘s Tech Crafts at ITP. Many thanks to Catarina for the excellent course.